The Central University Research Ethics Committee (CUREC) is responsible for implementing the University’s policy on the ethical conduct of research involving human participants and personal data. This states that all such research should be subject to appropriate ethical review. CUREC’s subcommittees are responsible for the review of researchers’ applications for ethical approval. As a general rule, applicants should decide which committee to apply to, based firstly on the department from which they are applying and secondly on the predominant research methodology or research procedures. However, applicants from departments with a departmental research ethics committee (DREC) should always approach their DREC first. Research with certain UK National Health Service (NHS) components requires review by the NHS Health Research Authority. Further advice about how to seek the necessary NHS review and approvals is available from the University's Clinical Trials and Research Governance (CTRG) team. 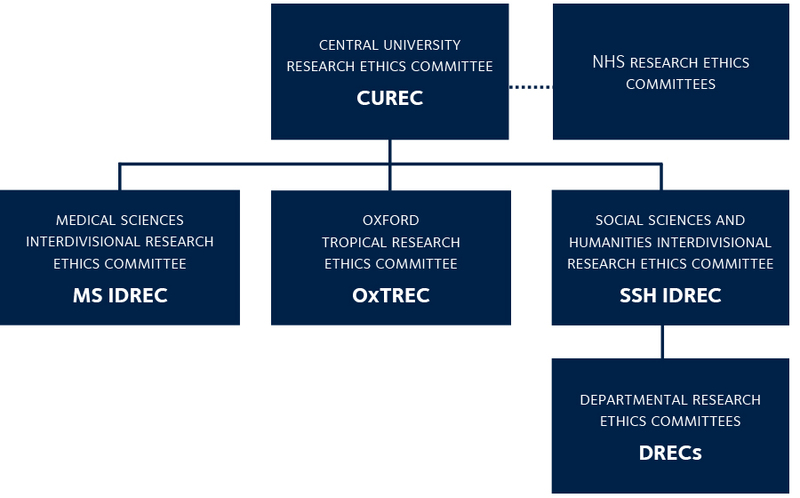 For other University research within its scope, CUREC offers a proportionate ethical review process which reflects the level of risk perceived in a given project application. Initially, applicants complete a checklist to decide whether research has only straightforward or complex ethical issues (see glossary definition of these terms). Straightforward issues mean a light-touch review process without the need to complete a full application form. In a limited number of cases, it will be necessary for applicants to complete the full form.